Preschoolers start "writing" by scribbling and drawing letter-like shapes in a large circular motion. Often, a young child's first letters are drawn by accident and then identified by the child or parent. Kids at this age will form letters to represent written language for meaningful words like their names or phrases such as "I love you." 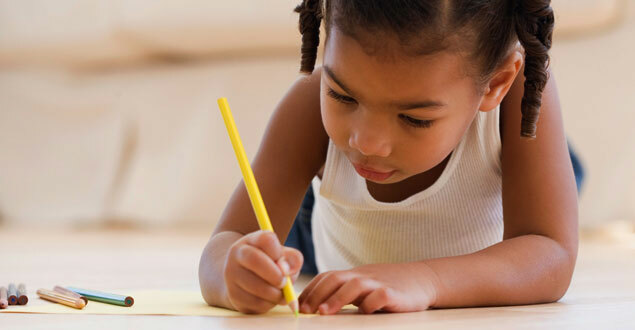 Preschoolers who see older kids or adults write begin to see that writing has a purpose and they will want to try it. Provide lots of writing materials — paper, pens, pencils, crayons, markers, and drawing tablets. This writing sample was created by an almost 4 year old boy. He carefully drew the picture and added the caption to the top. When asked what he wrote, the author said "Me and my family." What is this child able to do as a writer? This writer clearly separated the message from the picture. This lets us know the writer understands that print conveys meaning. The author is able to form some letters, and appears to have written the message from left to right. The letters are random, however, and the author has not begun to map written letters to the sounds in the words in the intended message. 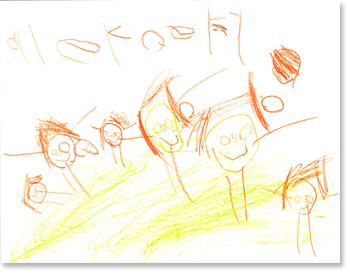 Move your cursor over each red bubble for observations about this child’s writing. What can we do to nurture this writer? Different types of paper, including memo pads, envelopes, lined paper and some smaller pens and pencils are good writer's tools at this stage. Tubs of foam letters and letter magnets are also handy.